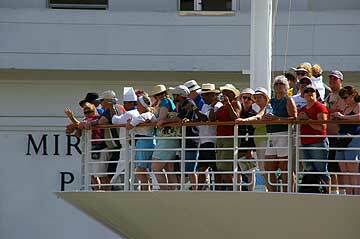 Radiance of the Seas is a cruise ship that is owned and operated by Royal Caribbean International. 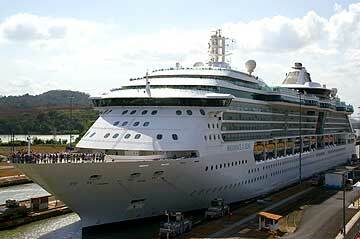 She is registered in Nassau, Bahamas, and is a gas-turbine vessel, the first built for Royal Caribbean. This system produces higher efficient speeds than other cruise ships, and emissions to the air are much lower than cruise ships powered by diesel engines. Radiance of the Seas is the flagship of the Radiance class, which includes Jewel of the Seas, Radiance of the Seas and Serenade of the Seas. 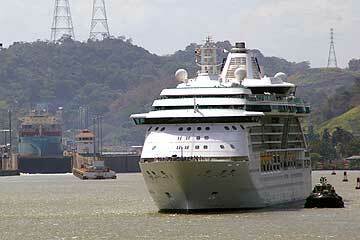 The Radiance of the Seas paid US $ 250'210.00 for its transit trough the Panama Canal on April 24, 2008. Radiance of the Seas is the first cruise ship to feature pool tables that are stabilized by a computer-controlled gyroscope. They adjust with the motion of the ship to keep the table-top level with the horizon.